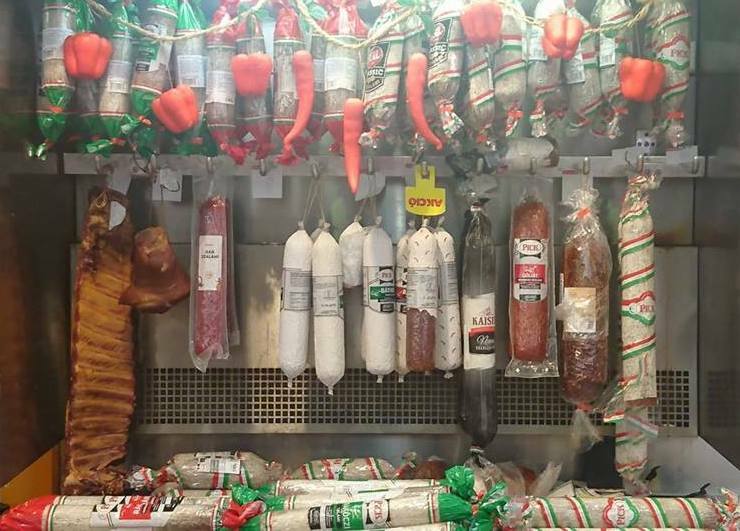 Sausages and salamis and the most popular meat products in Hungary, and no real market place in Budapest lacks a whole range of varieties and types of these delicacies. 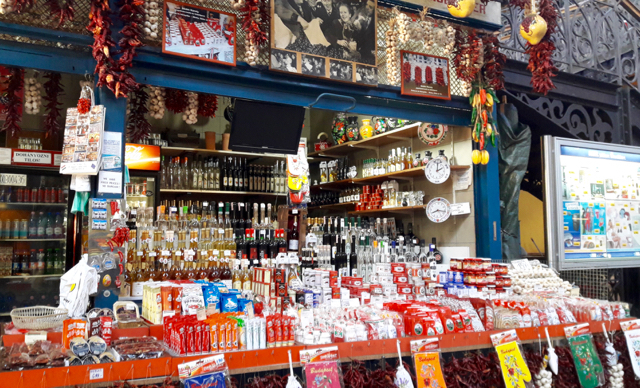 If you fancy tasting the best sausages and salamis, book a guided Budapest Market Hall Tour and enjoy the favourites of local people. 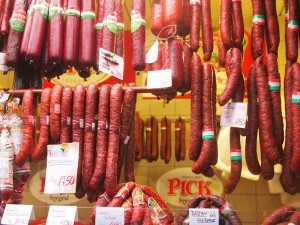 There are thousands of different Sausage (Kolbasz in Hungarian) varieties in Hungary. The tradition of making sausage at home still exists in Hungary. In the winter months, the families are coming together to slaughter pigs and fill up the larders with sausage, liverwurst, pork scratchings, bacon, salamis and pork fat. Making sausages are a living folk tradition in Hungary, many families have their own recipe from the elderly generations. The grounded and seasoned meat is filled into intestine or artificial sausage casings. When buying Hungarian sausage, try to avoid “industrial” versions, look for the homemade or traditional ones. 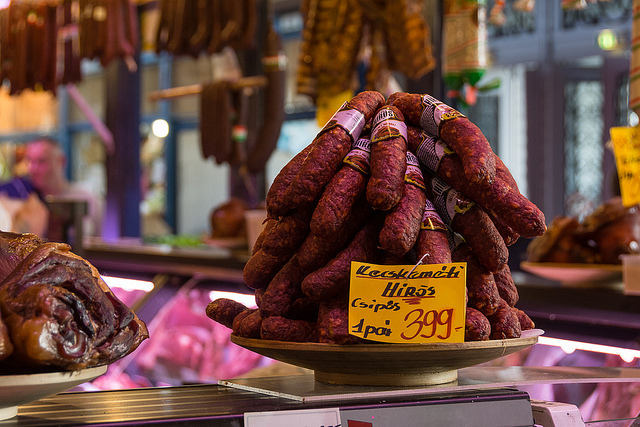 You can find sausages mostly of pork meat and fat, but there are special ones, for example, grey cattle, deer, or even horse and donkey sausages. This is a fresh sausage and needs to be baked in a frying pan or in an oven. It is soft and juicy, once it is baked it tastes nice with potatoes or bread, mustard and pickles. It is a beloved street-food style meal in markets or public happenings. It is usually baked with Hurka, boiled sausages that come in two main types “májas” (liver sausage), and “véres” (blood sausage). The main ingredient is liver and rice, or blood and rice. Spices, pepper and salt are added. Fresh Sausage for Boiling (Főző kolbász, Főznivaló kolbász). This type of sausage is also sold fresh and needs to be cooked. It is usually eaten with bread and mustard. This type of sausage is the least common type in Hungary. It is often cheap and contains big pieces of meat. It is the most popular sausage in Hungary and around the world. Ist is similar to Chorizo and can be eaten right away or as a snack or a sandwich. It gives a nice smoky taste to the cooked meals like potato and cooked egg casserole (Rakott Krumpli). The 2 most common smoked sausage brands are Gyulai and Csabai and both are Hungaricums. Gyulai sausage is slow cooked and wood smoked. It is made from fine pork, ‘szalonna’ (Hungarian bacon), garlic, Hungarian red paprika, garlic and spices. 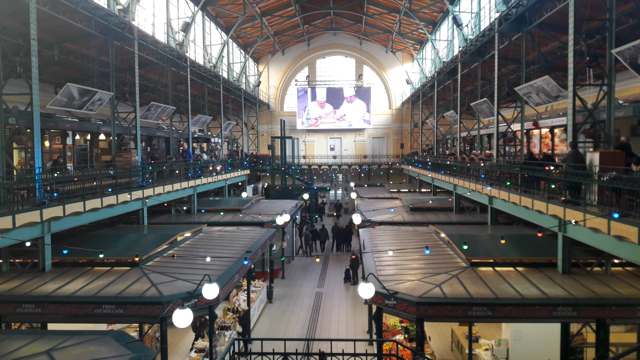 At the World Exhibition of Food in Brussels 1935, the Gyulai kolbász was awarded a gold diploma. Csabai sausage is made in the town of Csaba. This sausage has Protected Geographical Status (PGI) protection, so only the sausages from the Csaba region. It is spicier than Gyulai sausage and contains no pepper. 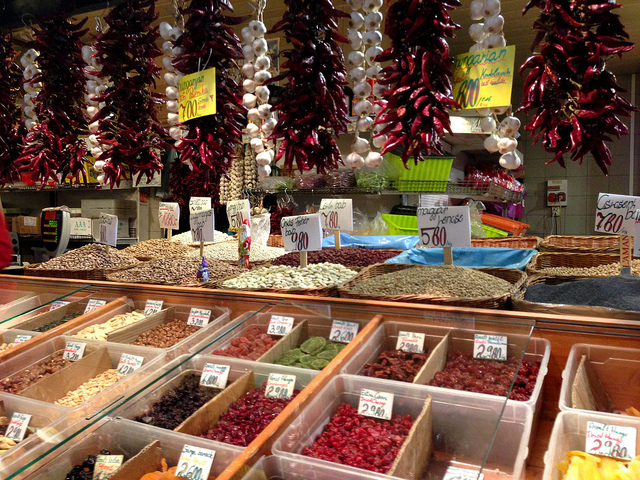 Hungarian salamis are also rich in spices and of course, paprika. Salami is made with the same process like sausage but it is thicker. Winter salami (Pick Salami) is a traditional cold smoked salami made in Szeged. It is spiced according to a secret recipe and covered with noble mould which appears during drying and maturation. Mould fungi need a chilly temperature and suitable humidity to settle down. Therefore, the factories were established at riversides, such as the original Pick Salami factory at the Tisza river.